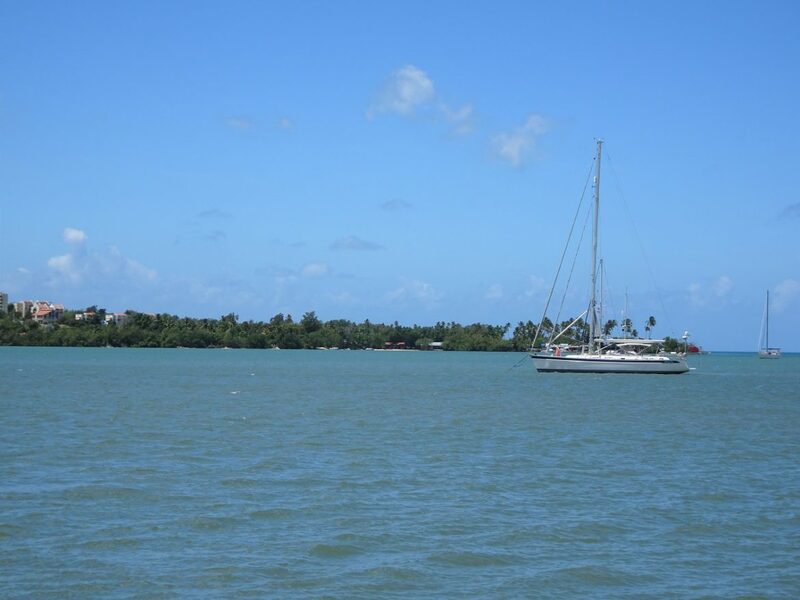 Saturday 19 Apr, Puerto Rico day 15: Sail from Boqueron to Puerto Real and maintenance time in the engine room. Another lovely fresh and calm morning. We are starting to love these thermal wind conditions (rather than trade winds) that vary predictably during the day and night. The sky is blue and Boqueron’s long palm backed beach empty in front of us. But by the time we have eaten breakfast and had a family call to Australia, the beach is transformed: umbrellas everywhere and the music has started. Puerto Rico is on holiday! Like yesterday the wind comes in from the SE like someone has flipped a switch and soon the bay is boiling with white caps. We go ashore to have a coffee at a very nice little cafe and boutique shop we spotted last evening. Oana is quite intrigued by the clothes they have for sale. Not her normal style so I’m quite happy that she tries lots on and ends up buying quite a few outfits … while her freshly ground Puerto Rican coffee goes cold! The town is really baking hot by mid morning. Somehow the air is very clear and the sun extremely intense, even with this strong wind. 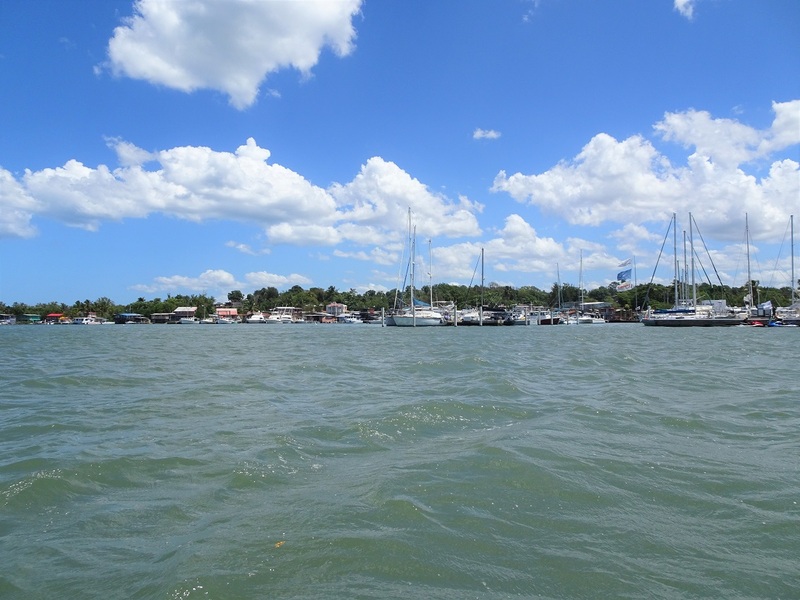 We retire back to Cloudy Bay and set off around to the next bay, Puerto Real, where Marina Pescaderia is, with fuel dock, check-out facilities and somewhere to leave the spinnaker for pickup. So far, on the phone, the marina owner Jose has been extremely helpful and friendly. Our only concern is getting into the bay. The depth charted over the entrance bar are just 2.5m and it will be low tide all day till 9pm. As it’s only 5 miles away we set off with just a partially reef genoa. Yet we still manage 7kts across Boqueron Bay in the 23kts wind. Once through the northern channel passing the barrier reef, we gybe to the north and are equally speedy in the strong offshore wind. All along the coast are bright white beaches covered in colourful umbrellas. It’s very tempting to anchor for a while, but we decide to get to our destination. Outside Puerto Real Bay we furl away the genoa to motor in through the shallow entrance. There is a marked channel that we follow. At first it’s a little unnerving because the channel takes us right over where out charts show depths of 1m, not where we see 2.5m. But it stays at 4-5m as we go in. We guessed they must have dredged it. But then suddenly the depth is down to 2.9 … 2.8m. Uh-Oh! That was close! As we get into the center of the bay we are in 3.5m and it stays that way all the way to the marina. Strangely, in here, the wind is light to nothing. Very odd. There are several yachts at anchor, one of them is the Swedish HR43 that we have been following these last days. We anchor in 3m of water as near to the marina as we can politely get. As usual, our preference is always to anchor rather than dock. Not just for the cost but also for the quiet and the clear breeze through the boat. In a marina it’s rare that we can get the hatches aligned to the wind (if there even is any) so the interior gets very hot. Out here we have a gentle breeze but the flags in the marina are lifeless. And thankfully we have a cloud over us, and the temperature is very pleasant. Ashore, in Marina Pescaderia we pay a daily charge of $10 to use their facilities (goal being the washing machines and internet) and have a very brief look to the village behind. 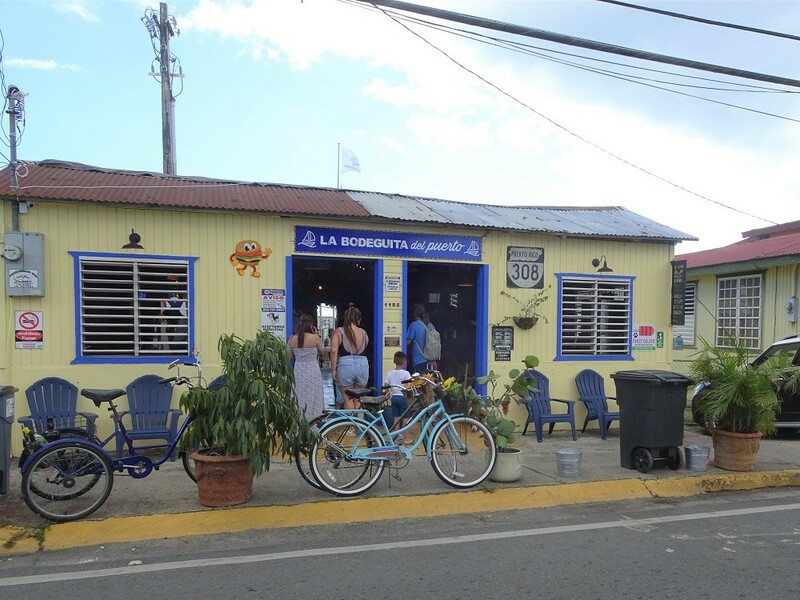 Much smaller and quieter than Boqueron but still with some nice places to have a drink and eat. The marina itself, as expected from reputation, has a really nice atmosphere and despite us not actually being docked in the maina, the staff are still very welcoming. After lunch we manage to connect to the internet. Yahoo! We have WiFi!! That will keep us busy. Several days of blogs to post and also research on Dominican Republic. This is what I did on the Volvo: oil change and new primary and bypass oil filters; new fuel filter; new sump breather filter; new air filter; impeller check; internal anodes replaced, new filters in the Racor external fuel filters; both Racors drained to inspect for water and debris; fuel samples taken from both tanks; raw water inlet filter removed and cleaned and finally the main exhaust flexible pipe removed to inspect for carbon buildup in the exhaust elbow and turbo fan. It’s now 10pm. Should I continue and do the generator? Well, let’s at least remove the oil. So after 30minutes of running the generator to charge batteries and warm up the oil, I set to the generator. This service is a bit simpler than the Volvo. I already did the Racor fuel filter and the generator fuel filter is only every other service, and that was last time. So it’s just the oil change, oil filter renewal and impeller check. I only changed the impeller 90 hours ago when I did a Rydlime anti-calc flush, so I was tempted not to check it. But good job I did. The little bugger was about to lose 2 if its fins already. So a new one was required to be installed. Hmm, I’ll have to be checking this impeller mid-service time. I don’t want bits of impeller rubber blocking the delicate raw water cooling path. The trouble with doing anything on the raw water systems (seawater) is that you simply cannot avoid some spillage and splashing. Salt water is highly corrosive to engine parts. So I have with me a garden water spray (pump up type) which I do my best to rinse the saltwater off with, after any spillage or splashing. Than a day later, when it’s all dry, I spray the area with T9 anti corrosion. Once corrosion starts on a marina engine, it’s a never ending task to keep on top of it. Last jobs in the engine room: I briefly run both engines to get the oil filters full, then re-top up the oil. Then cycle, several times, all the seacocks. There are 6 of them in the engine room. Then clean up, put tools back where they belong, and waste oil and filters and rags on deck ready to take ashore. And finally, at 1am, Glen himself gets a good service in the shower, then to bed, happy that job is completed.